Fall in love with Caorle in 6 steps! Question: Are there lots of good reasons to fall in love with Caorle? Answer: Of course there are! 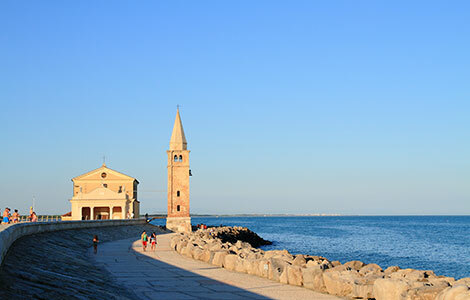 Caorle is one of the gems of the Adriatic Riviera and a visit to the town comes highly recommended. As well as historical and cultural treasures, it can also offer outstanding food, wine and leisure activities. It is famous for its stunning seafront promenade and the colourful fishermen’s houses in its distinctive old town centre. 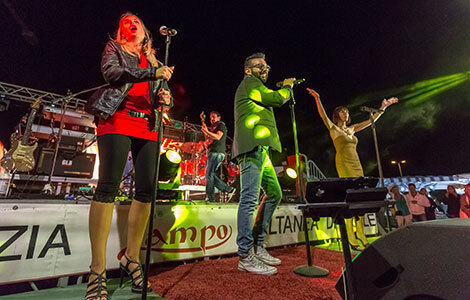 Let’s take a look at some of the reasons why Caorle definitely deserves a visit! It’s no surprise that the magnificent Sanctuary of the Madonna dell’Angelo is the most famous landmark in Caorle! It is a strategically located little church that marks the boundary between the Levante and Ponente sections of the long Caorle beach. Have you ever been inside? It is tiny, but the altar adorned with shells is truly breathtaking and it really feels like you are being embraced by the sea. If you’re looking to win someone’s heart, bring them here at sunset and you can’t go wrong. Don’t go thinking we’re crazy. We could never compete with the most famous ocean resorts, or even those by the Mediterranean. 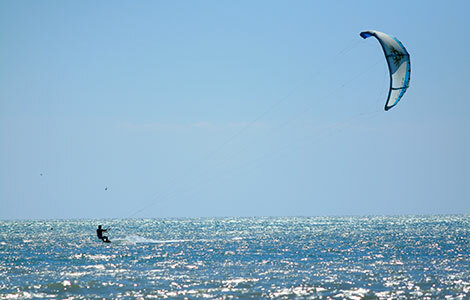 Nonetheless, the Falconera area at the end of the Levante beach has been welcoming numerous kitesurfing enthusiasts for years. There is plenty of wind for them to harness, especially in the spring. It’s a marvellous place not only for taking part in the sport but also for simply watching the amazing athletic endeavours of the many kitesurfers being propelled across the water all day long. If you park your car and spend the morning strolling around Caorle, you’re bound to work up an appetite. The delicious fragrances emanating from the bakery in the old town centre and the kitchens of the many restaurants lining the streets will only make your mouth water even more. Keep hunger at bay with a classic snack to enjoy on the move: take-away fried fish! 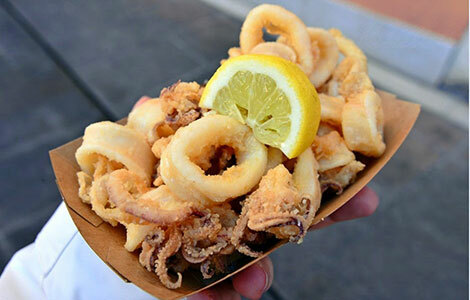 It’s a real institution in Caorle and the choice includes everything from traditional calamari rings to a full fried seafood selection, not to mention chips! It’ll really hit the spot and get you ready for another classic: a glass of wine for an aperitif, which is known locally as an ombra de vin. Alternatively, savour a freshly baked slice of pizza while you decide whether to carry on strolling or head down to the beach! One of the joys of going on holiday is finally having time for the things that you don’t normally do. We want to step up to the next level and suggest an activity that is not only quite rare nowadays but will also give you a taste of the past. In addition to serving breakfast and light lunches – not to mention providing cool shade – during the day, Caorle’s many kiosks also help to liven up the evenings by playing a superb selection of music. You know you aren’t in Ibiza, so don’t turn your nose up at the idea. Get on the dance floor and strut your stuff with a waltz, tango or even some exotic, extravagant Latin American moves. Take our word for it: not only will you have a good time, you’ll also make lots of new friends and you’ll soon be laughing about what inept dancers you all are! The Fish Festival is one of the most striking and enjoyable traditional events around! After a break of a few years, thankfully the sage decision has now been made to bring it back! 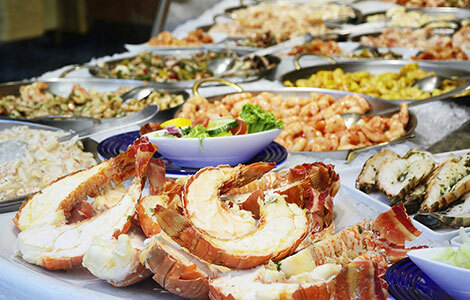 Fishing is one of the main cornerstones of Caorle’s economy, so celebrating it is an absolute must. Even if that were not the case, nobody would be able to resist the divine aroma of the numerous culinary delights that are served up for the occasion. 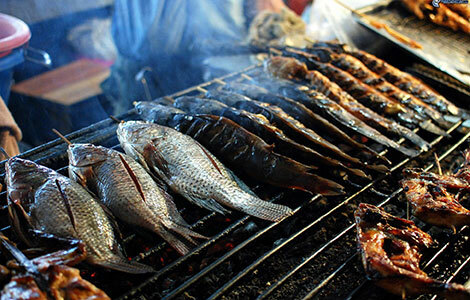 Grilled fish, seafood salad, the local dish known as broetto, stockfish, pasta, rice… need we go on? 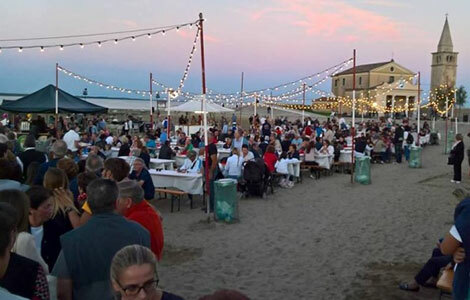 Furthermore, since last year the location for the event has been Madonnina beach, with its fine sand, little boats in the background and the peaceful sound of waves lapping against the shore. As the previous five points have perfectly illustrated, holidays are all about discovering or rediscovering traditions, both old and new. Going for a bike ride falls firmly into this category. 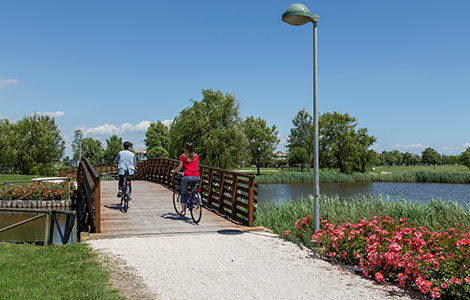 Caorle has a vast network of modern, perfectly maintained cycle paths that provide exceptional, problem-free links to the nearby Porto Santa Margherita and Lido Altanea areas. 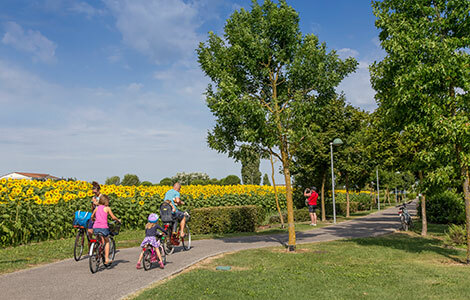 Safety is a top priority and the picturesque landscape includes stretches of the seafront, green countryside and bright yellow fields of sunflowers. Don’t just take our word for it: get on your bike, start pedalling and feel the breeze on your face. It’s a great way to get away from it all and have fun, whether you take it steady or pedal like crazy up the hills and then fly down the other side with your feet off the pedals like you did as a kid.